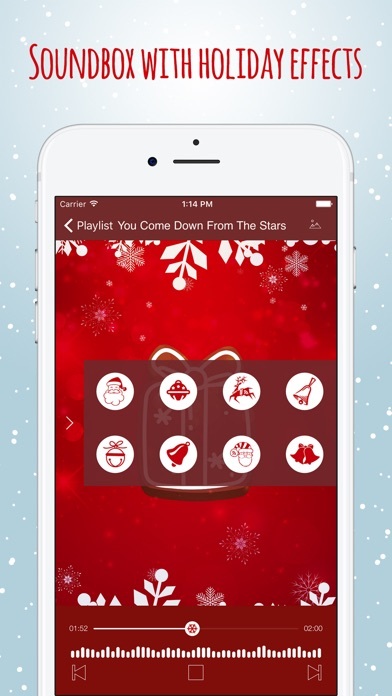 ※※ This app contains ※※ • Christmas music playlist! • Soundbox with holiday effects! • Amazing wallpapers to download! • iMessage Stickers! The days are getting shorter, and as the first chills of winter creep down the spine we can all feel the festive spirit of Christmas approaching. What music are you listening to during these chilly days? Are you getting in the mood for presents, and for carols? 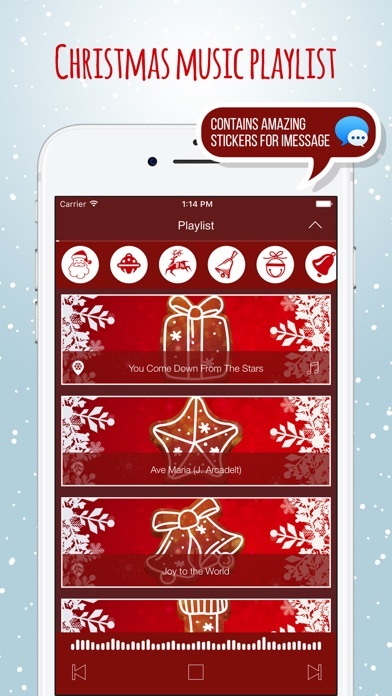 How about listening to the songs from Christmas Play List Holiday, the app created to satisfy your thirst for Xmas music when the season rolls along! Don't waste time searching for streaming radios and online music when you have the perfect holiday party playlist at your hand. Christmas Play List Holiday features 10 exclusive songs you can listen everywhere, without any need of connecting to the internet. You might recognize some of the most popular and loved carols of all time within the tracks we carefully selected for you to enjoy: 01. You Come Down From The Stars 02. Ave Maria (J. Arcadelt) 03. Joy to the World 04. Carol of the Bells 05. Dona Nobis Pacem 06. Gloria in Excelsis Deo 07. I Saw Three Ships 08. Peer Gynt 09. The First Noel 10. God Rest Ye Merry Gentleman Top it off by adding Christmas sound effects to your christmas party jingles. Thanks to our festive soundbox, you will be able to play a selection of some cool FX to liven up the mood. From bells to laughing Santa, we have it! But wait! The exclusive content does not stop there! By choosing to download Christmas Play List Holiday, you will gain access to 10 unique HD wallpapers created for this chilly season. And finally, spread the Christmas spirit around. Do it thanks to 20 new and amazing iMessage Stickers, only available through this app! We hope you enjoy our content, and that it can brighten every one of your days while counting down 'till Christmas. If you love it, please leave a positive review on the store, and let us know how to make this experience even better for you.